There are a broad range of specialty fields within the greater umbrella of nutritionist. Each professional in the field has their own specialty area on which they focus their skills. An intriguing specialty in this field is the Sports and Fitness Nutritionist. Sports Nutritionists practice in a field which combines an intensive knowledge of diet and nutrition with education in the workings of the human body, particularly in how the body and diet interact. Check out an overview of the preparation and education you need to become a sports nutritionist, and details about job duties, training and licensure. Sports and Fitness nutritionists help to educate athletes about healthy lifestyles and diet. They help to establish ways to improve the health and performance of fitness enthusiasts, and to manage weight by placing focus on the right dietary principles to enhance the effects of exercise, as well as the proper use of supplements like vitamins and minerals. In order to practice as a sports nutritionist, many states require licensure. There is also optional national certification available, and all those practicing in this field are strongly encouraged to seek this certification. At minimum, you’ll need a bachelor’s degree, but it’s well worth the education and certification, as those in this field make an average salary of around $58,000 according to the U.S. Bureau of Labor Statistics, and the field is expected to grow by 16% by 2024, meaning there are a lot of potential job openings. Many nutritionists in this field work as independent, private consultants. They are given access to their client’s lifestyle choices, from their training schedule to eating habits, use of any supplements taken and medications used. They work with the athlete to create personalized programs to set and achieve specific goals both short term and long, and they may even monitor their clients to make sure they stay on task. 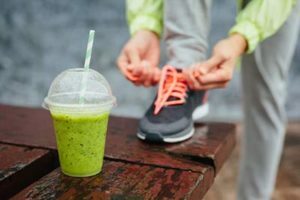 Other functions of a fitness nutritionist include consulting about supplements, testing body composition and metabolic rate, and even medical nutrition therapy. Sports nutritionists are different than other nutritionists in that they provide nutrition plans and education about recovery needs. They are specially trained in physiology and biochemical compositions so that they can provide the best possible advice. If you would like to become a sports nutritionist, your first step is to acquire the right education. At minimum, you’ll need to have a bachelor’s degree, and many people who seek to practice in this field pursue higher level degrees such as a Master’s or even Doctorate in nutrition science. The more education you have, the more credible you will be, in general. You’ll also want to check your state’s individual laws and regulations regarding practicing in this field. Many states require specific licensure to provide nutritional counseling. This could require becoming an RDN or simply seeking your state’s licensure path. If this sounds like a career about which you can be passionate, you should check our page outlining the requirements to become a dietitian or nutritionist in your state today.